Read the true story about how degreed theologian Jan Dunlap found redemption, joy and healing from severe anxiety by adopting a rescue dog called Gracie. After a heart-wrenching medical misdiagnosis Jan felt her personal faith in God and her enthusiasm for life slip through her fingers. She was gripped by fear and debilitating insecurity to the point of suffering from severe bouts of anxiety attacks. But all this began to change when her daughter adopted a rescue dog. Enter Gracie... a black Labrador with bags of energy and zest for adventure. As they began to share life together Jan realised that Gracie was helping her to overcome her anxiety, re-invigorate her faith and bring emotional, spiritual and physical healing. Through appreciating God's design in creation Jan discovered life was for living. Half-biographical, half-medical exploration, 'Saved By Gracie' invites readers to discover Jan's emotional journey of healing amongst stories of chasing squirrels, fetching sticks and discovering nature. The perfect read for pet-lovers and those looking to revitalise their life. 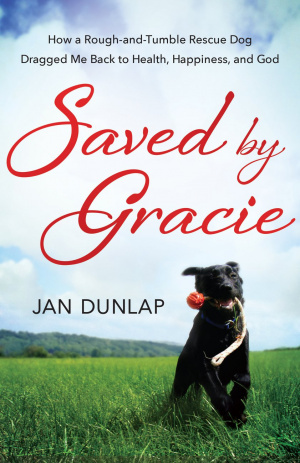 Saved By Gracie by Jan Dunlap was published by Authentic in April 2014 and is our 8045th best seller. The ISBN for Saved By Gracie is 9781780782270. Be the first to review Saved By Gracie! Got a question? No problem! Just click here to ask us about Saved By Gracie. Author Jan Dunlap was suffering increasingly severe bouts of anxiety after a medical misdiagnosis slapped her in the face with an acute realization of the tenuous nature of human life. A degreed theologian, Jan found her personal faith in God and His promises severely shaken and her enthusiasm for life being replaced by growing fear and debilitating insecurity. Then a rescue-shelter black lab-mix by the name of Gracie came into her life as her daughter's new pet, and Jan determined to do whatever it took to provide both her daughter and the dog with the sense of security she herself no longer felt. She quickly discovered, however, that Gracie had her own agenda, and it was all dog. From chasing squirrels to jumping fences to the occasional roll in dead fish, Gracie taught Jan that life is for living, not dreading. As she began to realize that Gracie was helping her manage her anxiety, Jan also came to a new awareness of how a loving God provides healing through His own works of creation. Part memoir and part medical exploration of the truly healing gifts that God freely offers us through our interaction with animals and nature, Saved by Gracie is a story of God's redeeming love revealed at the paws of a dog. CHAPTER 9 | Where Does the Fried Chicken Come From, Anyway?